all items paid for have been packaged and will be shipped tomorrow morning! i got back from my vacation on the 11th, my apologies for it being so delayed because of that. other than that, i just have a few wants. 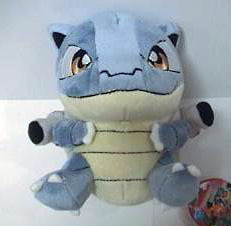 Or the petit plushie pics..
And my question is, how rare are the Blastoise and Venusaur banpresto UFOs? And how much they usually cost? I don't think I ever saw them in a straight sale, only in GAs. I know the rarity and price of Charizard, but luckily I already have him and I want the other two so he doesn't feel lonely x)! 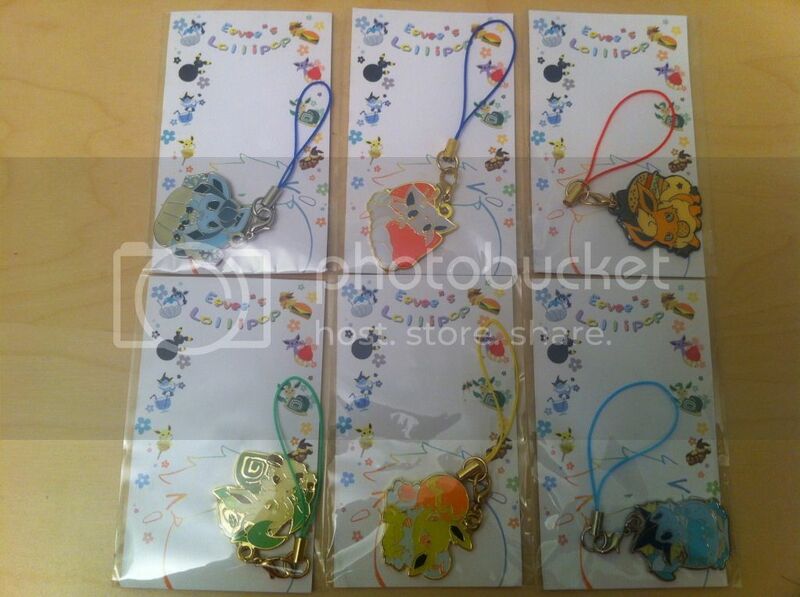 If you recently sold one, or have any of them for sale pass me the info please! Hasbro beanies and Pokedolls GA lost and a reminder. I placed our max bid and we were outbid, and then I bid again adding more to my own bid, and we were still outbid. Jakks has been busy, and so have I! Hey guys. Just making a community wide post about this group auction, and its status. As the bidder on this lot, I feel incredibly upset that we lost it due to myself being unable to perform what I came to do with this GA. I was needed for a double shift yesterday, and the day would have been impossible for everyone else if I had not been there. Since I was at work, I had left my cell phone in my locker, and was unable to raise or tally bids yesterday when I needed to. For this I am truly sorry, and hope that you all may participate in any future GAs I may host or help with. If anything comes up and the person who won the auction is unable to pay, I will go through and notify you all of the change and send individual invoices for your items. I hope that everyone is able to find what they were hoping to bid on soon, and that nobody has been too terribly upset throughout all of this. Hi guys. 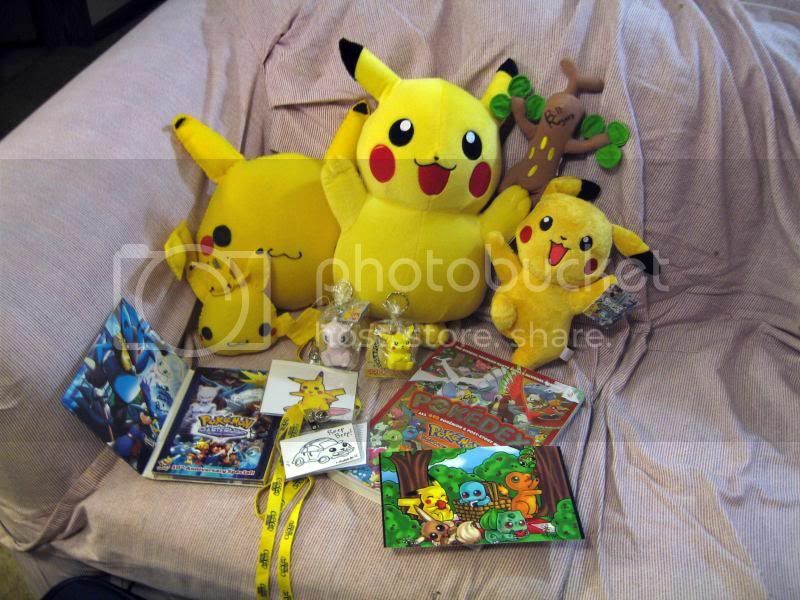 My grandparents went through some of their stuff stored away in their house and found several of my missing Pokemon items I had when I was a kid. I'm still searching through it all, but I found something interesting that I thought you all might be interested in. 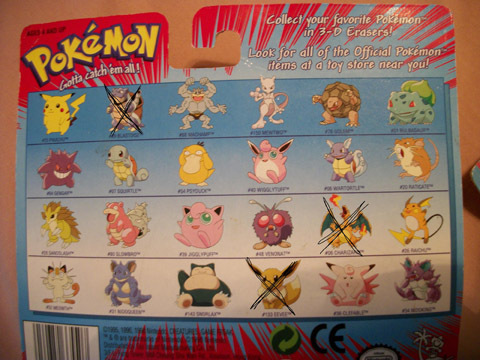 There are 31 in all - excluding Jessie and James who I keeping - and they will be going up for auction. Photos and info are under the cut. Giant Snorlax (Walter) has a new shiny friend. THESE SALES ARE CLOSED, NOW. THANK YOU! ★Do you like this form better? Less? The same? 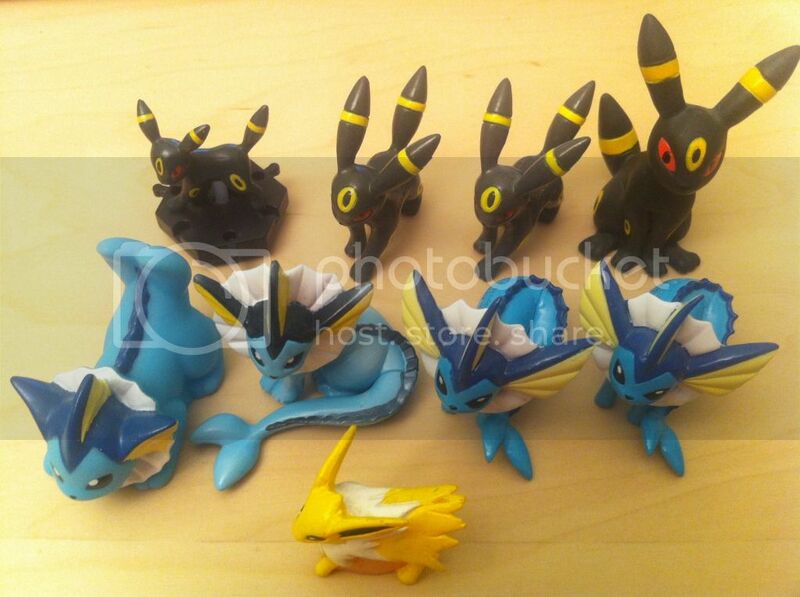 ★If you weren't going to collect "little" Keldeo, are you interested in merch of this one? ★If you only plan to collect either "big" or "little" Keldeo, what is your reason for picking just one? 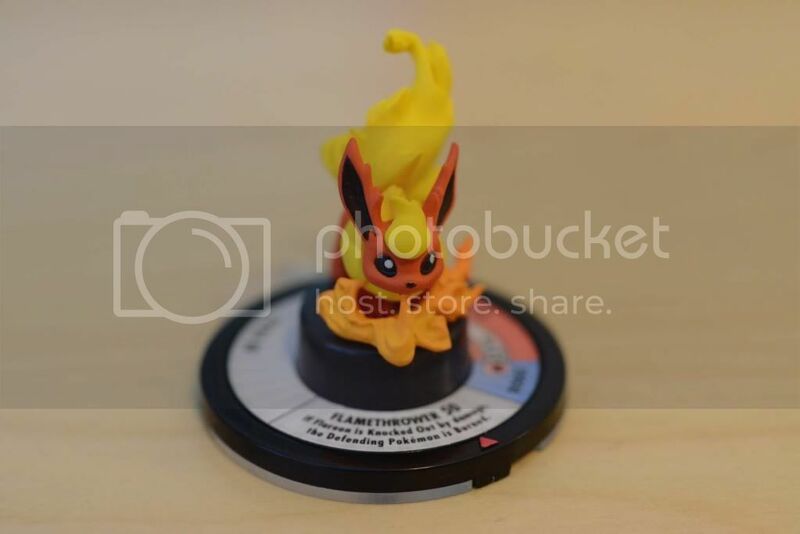 I suspect we'll already be seeing Keldeo Resolution Form merchandise images as soon as next week, when Banpresto puts up its July lineup, and Bandai puts up a better image of its July kids. Please keep opinions about "too many forms" to a minimum. It's a legit opinion to have, but it's not what the discussion should be about here. There's other places to complain if you don't like Pokemon with forms! The pic for the August kids set is also out now. This is a great set!! I would really appreciate it if you help me find this guys for a more or less affordable price. Today I came home from school to find two boxes waiting on my doorstep. One was the Wailmer and Friends GA (so expect shipping totals soon and let Rhys know if you want to combine with Mewtwo GA all lots for that were won!) and the other contained awesomeness that I cant find the words to describe! That's it from me today. Hope you all have a swell week! Guuuuuys (and gals), I need your help! Thanks to all the input, I was able to conclude that it is most likely to be a bootleg. Found some additional features to look for now as I continue my search. This community is the best! Totals are to sockmehard(at)hotmail.com please include your username :3. 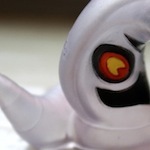 I was hoping to have some sales to add to this post but my package hasn't showed up P:. I decided that I need a "Yay 20th birthday but also somehow passed my first year at uni so I deserve a pokemon present!" try saying that ten times fast with a mouth full of cereal. 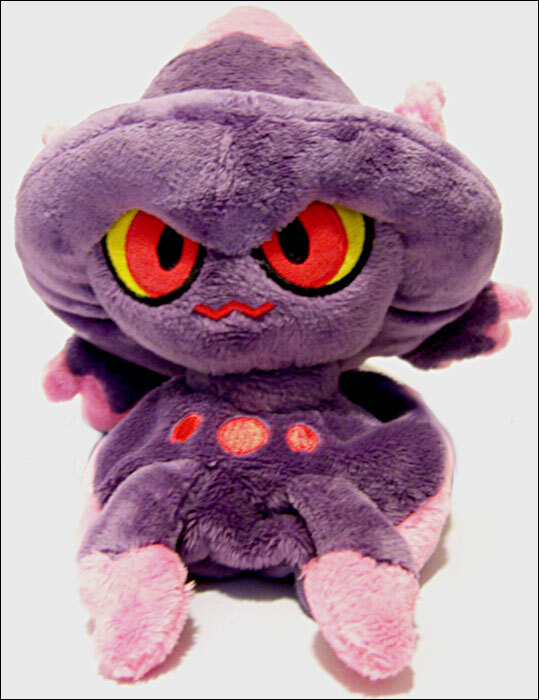 I'm also after tentacool/cruel merchandise! if anyone has some i'd love to know! 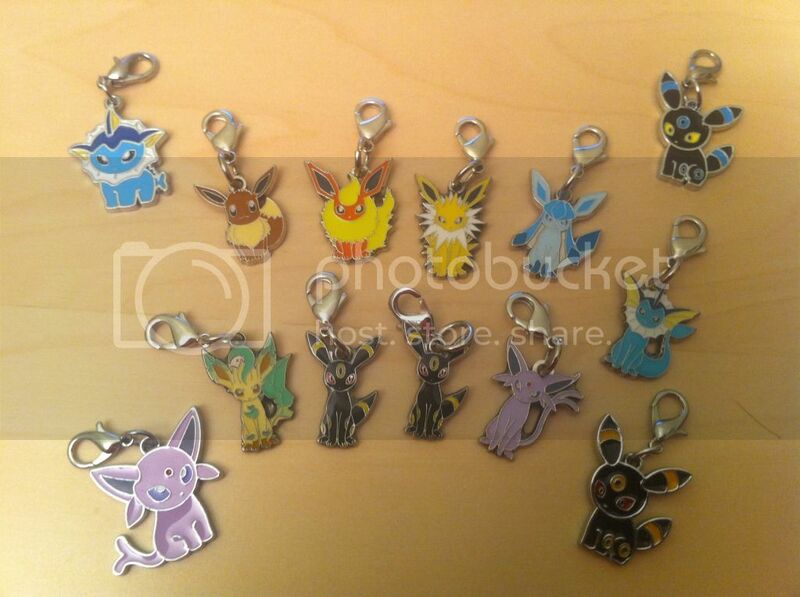 I'm particularly after the swing keychains & metal figures. 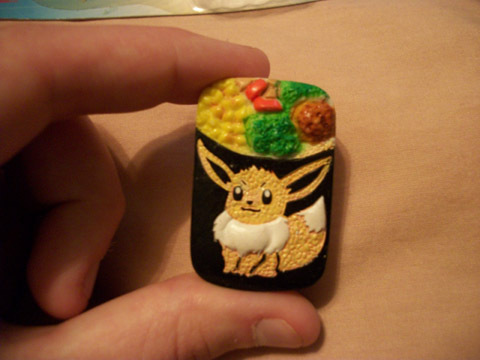 Just to make the post a little less boring I have a random question: From the time you joined the community what pokemon did you intend to collect and did that change at all? Good day, citizens! It has recently come to our attention that a large amount of members are involved in transactions that will not be completed before Paypal’s 45-day dispute limit is up. As per our community rules, that’s not acceptable. It allows the buyer absolutely no recourse in the event there are any issues with the transaction, and while the vast majority of community transactions run smoothly, the risk is unacceptable. If your buyer does not receive their item within 35 days of payment and especially if you are difficult to contact, a paypal dispute will be opened. Sellers- keep receipts and other proof of shipment (if possible) in case a buyer becomes suspicious and/or dispute is opened or if you need to prove a package was 'lost.'" The community recommends 35 days as a buffer for Paypal’s 45-day limit to file a dispute. Disputes, contrary to what some people fear, do not automatically ask Paypal to take money away from the seller to issue refunds. They simply open up a line of communication between buyer and seller to work out a way to satisfactorily complete the transaction. For more information, please read below for Paypal’s full explanation on disputes and how to access the information in your own Paypal account. 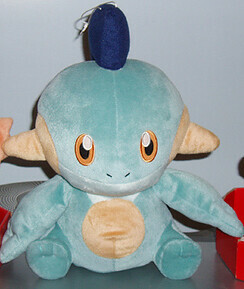 Specifically, members who have pre-orders with donny9 for MPC plush that he was supposed to receive in June (Deerling, Mienfoo, Deino, Roggengola, Fraxure, or Garbador) should check the date they sent payment because many buyers have realized that they are literally at the 45-day mark. The shipment of MPCs was delayed, yet payments were still taken and/or not refunded, resulting in non-compliance with the community’s Paypal dispute policy. donny9 was specifically told before that he could not take payments without providing the items or proof of shipment within that time frame, yet it occurred anyway, and unfortunately the moderators are only just now finding out about it. We are currently in talks with him about ongoing rule-breaking situations and need the disputes open as a precaution. We predict he will refund everyone promptly without issue, but the disputes need to be opened just in case so there is 0% chance of any incidents. We are still in the process of determining how many rules he has been breaking over an extended period of time; while we are uncertain of where the situation will lead, we predict and hope he will be compliant and attempt to correct the numerous issues of which this is merely one. He has advised us that he will not be back online until the time limit has potentially elapsed for many of the transactions, so please open disputes while the option is still available and close them once a refund is issued. Additionally, any members involved in current or future so-called “group buys” or Banpresto pre-orders with him will be informed shortly of the ongoing problems and how we are working to resolve them. This announcement is not isolated to this one incident, and we encourage everyone to stay on top of when their dispute time limit is up. Make sure to maintain communication with your buyers and sellers, and attempt to reach out before the deadline approaches. Paypal disputes should not be closed if the seller merely tells you when they intend on shipping the item(s) in question, but rather when you either receive the item or they can provide proof that they have already shipped it out. We are currently working on creating an in-depth guide to all things Paypal-related, but in the interim, please do not hesitate to ask any questions you may have. All the moderators will work very hard to respond as quickly as possible. good day, ladies and gents. I have two very special gets I would like to share! I'm not brilling with money atm, so please let me know if you have any of these in... not so great condition. I don't mind scratches here and there if it means I'll be able to afford it, haha. you can see pictures of all my wants here, but I'm really only looking for the three things listed right now. super cool rare snake update and sales! Like any of the pokemon below? Come see what I have! Porygon, Spinda, Posters, And a Sales Post! Hey there guys and gals! 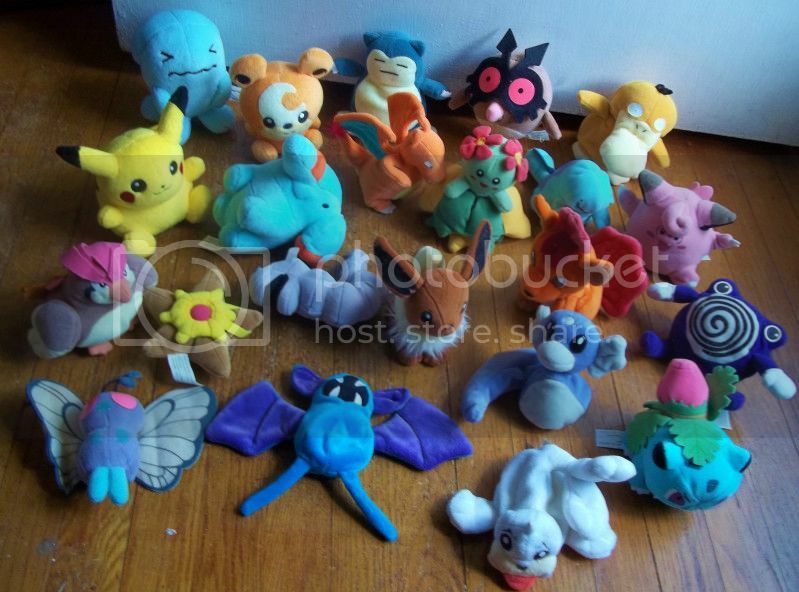 So I decided to minimize my collection to just rotom so I have all of my figures and flats from my porygon and spinda collections up for sale! I also won a bunch of posters in a tournament in a new league I went to so those are up too! Have fun guys! All of these Auctions will end in a week (Wednesday June 20th) at 11:59! PLEASE WAIT FOR ME TO POST THE THREADS! Done! If you have an underscore at the beginning or end of your username, or have a double underscore anywhere in your name, PLEASE do not try to access the feedback system at this time!! tortoises is in an exam at the moment and needs to fix something with your names before you can properly use the system. Hey everyone!! Here are your Pokemon Mate totals. :D Everything that needed to be picked up was done so without a hitch! Please double check my math and numbers to ensure you're paying the right amount as well!! Thank you! 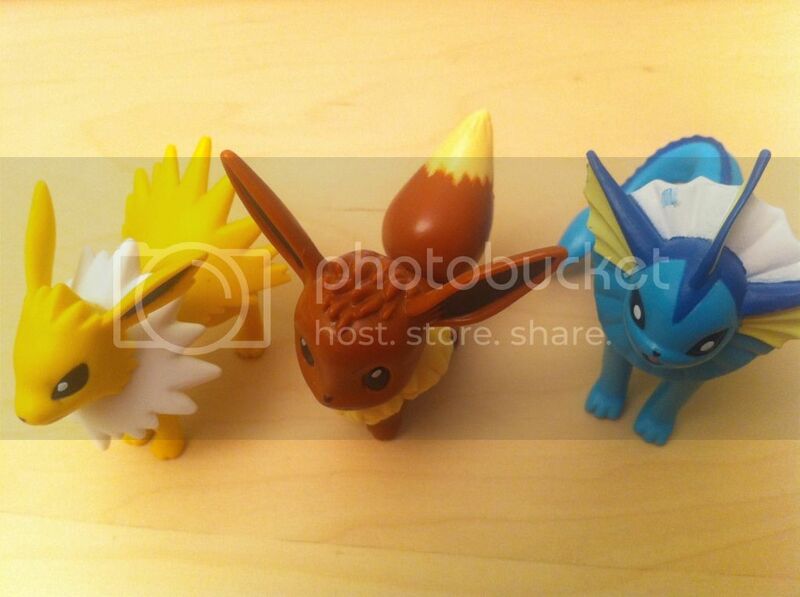 Just a quick reminder that my Flareon TFG auction ends in under 24 hours! Also I lowered the prices on my sales. Hey everyone! Just posting here today to tell you all that, after literally two days of work taking photos, ruining my back and putting them up, I've finally finished my collection website, so it's now officially open. It's not very fancy or anything, but I think it looks nice enough. Obviously it'll be updated as more items join my collection. 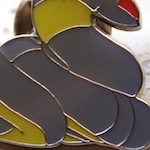 Click the little banner (or this) to get there! Please check the cut for all info! Hello everyone! Today is my birthday and so I thought I would share my presents with all of you! OMGcon was in Paducah, KY on June 8th-10th. The theme this year was Pokemon, and it's only about 4 hours away, so my husband and I took Pikabug and made a nice weekend trip out of it! I'm hesitant to say vacation, since we both came back exhausted. Pikabug was very well received, he was displayed up on the sidewalk in front of the convention center, and I don't think a single person walked by without stopping to look. The majority took pictures. 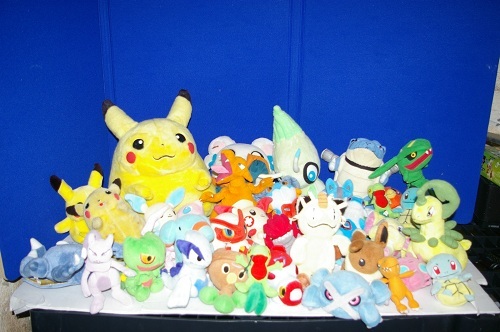 I had a plush display set up in the back, and everyone loved trying to see if I had their favorite Pokemon in there. I was even asked to be a guest judge during the Pokemon Party, where an announcement was made about me being the owner of the Pikachu car. This had me blushing to no end, I'm extremely shy, but I did my best! The rest of the weekend I had people whispering "there's Pika Freak, she owns the Pika car out there...." as I walked down the hallways. More blushing! Of course, all of us here know the main reason for attending an anime convention. Making new friends and meeting voice actors is great, raves are fun, but the REAL reason is the vendors room and artist alley! And I didn't come back empty handed. 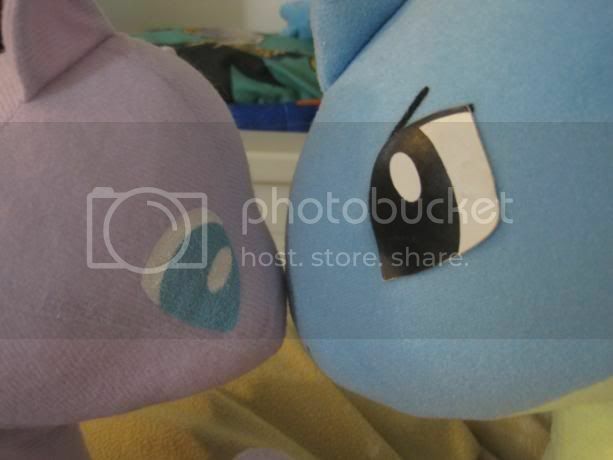 Click the cut for all the close ups, and other random pictures from the convention! AZ Collectors--Lets talk meet up! !